It’s easily one of the most metallic albums they ever made, so it’s certainly likely to go over better with hard-rock aficionados than any of the band’s post-‘70s albums, but although the band certainly exhibits a considerable amount of promise here, their instrumental chops (and, of course, Freddie Mercury’s soaring voice) are far more attention-grabbing and impressive than the songs themselves, the material here being a bit too idiosyncratic to really be called infectious. For one thing, the band is just a tad too fond here of very disarming shifts in meter and mood, not quite to the extent of qualifying as prog-rock but still too complex to quite be pop, either, the deceptively lovely ballad “Doin’ All Right” even taking a long mid-song detour through nearly half a dozen different changes in tempo or tone before finally settling back into the dreamy stylings of its first verse – and it’s easy to see why a hit single eluded them in the U.S. for those earliest years of the band’s existence. The album is certainly brimming over with ideas, which helps to keep the disc interesting even when the band seems unfocused, and there’s even a pair of can’t-miss moments in the early classic “Keep Yourself Alive” and the snarling rocker “Liar,” a true contender for the title of the band’s most underrated single of the ‘70s and worth the price of admission alone, but this album is really more for the band’s most diehard – or more hard-rock-minded – fans, since the band’s songwriting chops aren’t sharp enough yet at this stage to deliver the sort of hooks that would eventually help the band to become one of the most beloved arena-rock bands of all-time. 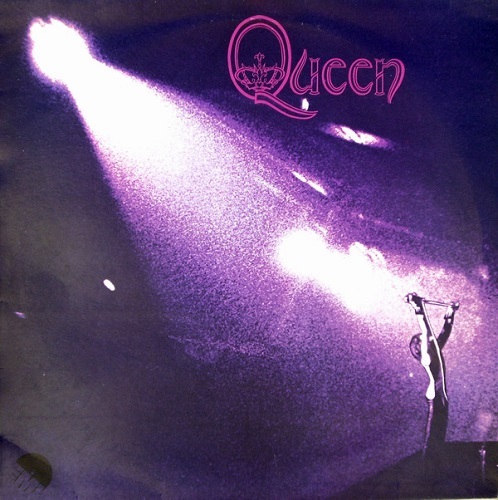 A dramatic improvement on the last two records and the first in a string of classic Queen albums, this nearly filler-free release – ironically written and recorded simply as a way to bide time until May, suffering from hepatitis at the time, could go back on the road – finds Queen shedding (both lyrically and musically) some of the more overt mysticism and prog influences of the first two discs and letting more hints of pop – and even cabaret – seep into their unique brand of hard-rock. More importantly, the band has started to blossom as songwriters here, all four members contributing to the writing for the first time (John Deacon supplies his first song for the band in “Misfire,” while all four members are credited with penning the absolutely blistering thrash of “Stone Cold Crazy”) while the hooks are starting to become a bit more abundant, especially on the cabaret-tinged pop of the stellar single “Killer Queen,” which would become the band’s first American hit, going all the way to #12, and the sing-along “In the Lap of the Gods … Revisited.” May’s guitar heroics reach a new apex on “Brighton Rock,” while the cleverly-mixed “Now I’m Here” is the perfect blend of pop and the band’s more theatrical tendencies. Even the novelty of the vaudeville-tinged “Bring Back That Leroy Brown” is a fun display of the band’s versatility. 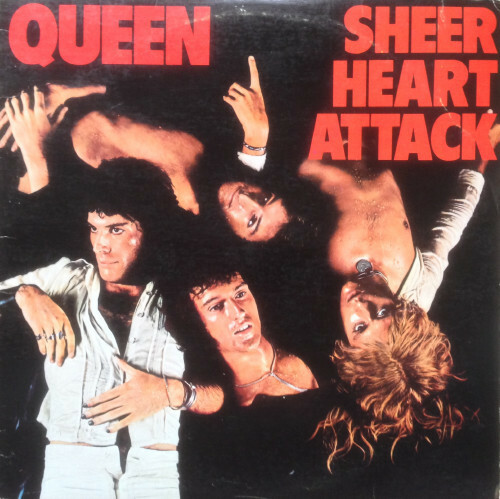 Sheer Heart Attack is definitely the more metallic of the two albums and is arguably the more fiery for that reason, but in terms of sheer artistic quality, A Night at the Opera is not only a step forward – one that takes the versatility demonstrated on the last album and fuses it with even stronger hooks, not to mention a newfound sense of humor – but arguably the best overall album piece the band ever made. The album gets off to a rip-roaring start with the underrated “Death on Two Legs,” which lightens the band’s sound sufficiently enough to sound like a grittier and more darkly-comic version of British pop band 10cc, and the band ventures into even more daringly playful territory for a hard-rock band on the vaudeville of “Lazing on a Sunday Afternoon” and the musical-theater stylings of “Seaside Rendezvous. Freddie gets to tap into his romantic side on the soul-baring sparse balladry of “Love of My Life,” one of the group’s all-time loveliest moments, and the mellow groove of the John Deacon-penned, electric-piano-driven “You’re My Best Friend,” another American Top Twenty hit. Not that the album’s all mellow, of course – the disc is anchored by two of the band’s most ambitious rockers yet: the epic “The Prophet’s Song” and the band’s masterpiece, the groundbreaking multi-movement six-minute sweep of “Bohemian Rhapsody,” which defied just about every single convention of your typical mid-‘70s pop 45 and yet did so in a way that was so unexpectedly infectious and engaging that it nonetheless became the band’s first Top Ten hit and even nearly topped the charts upon re-release fifteen years later after being prominently featured in the film Wayne’s World. While more casual Queen fans will most likely recognize only two songs here at first, that actually works to the album’s advantage, as it’s one of the few rock albums of the ‘70s of its quality and renown to have avoided having the majority of its tracks overexposed on classic-rock stations. The band has jettisoned longtime producer Roy Thomas Baker here, opting for the first time to produce itself. A companion piece of sorts to A Night at the Opera, this isn’t nearly as good – or nearly as distinct an album piece – as that album, but it nonetheless continues the band’s winning streak of fine releases. Cleverly, the band avoids the question of how to top “Bohemian Rhapsody” by leaving the mock-opera of that song behind in favor of experimenting with incorporating their choral talents into a full-blown exercise in gospel on the joyful “Somebody to Love” to remarkably authentic and endearing results. The band still excels in contrasting styles; “Tie Your Mother Down” rocks harder than just about anything else in the Queen repertoire, while “You Take My Breath Away” is as subdued and lovely as “Love of My Life” from the prior disc. “Good Old-Fashioned Lover Boy” is another one of Mercury’s surprisingly appealing excursions into more vaudeville-styled territory. While the disc can sporadically feel like a calculated effort at repeating the success of its predecessor (even “Tie Your Mother Down” is heavily indebted to the back half of “Bohemian Rhapsody”), the band does throw some new curveballs into the mix in the form of the surprisingly straightforward driving rock of Deacon’s “You and I” and the distinctly-Big-Star-like power-pop of the Brian May-sung “Long Away,” one of the great hidden gems in the band’s catalog. The record undeniably has some filler, namely on the second side, but it’s just a slight notch below Sheer Heart Attack in quality overall and still has plenty of great songs to keep you coming back. Jazz suffers from the same problem A Day at the Races does, in that it sounds like a moderately rushed follow-up to a less spotty record. 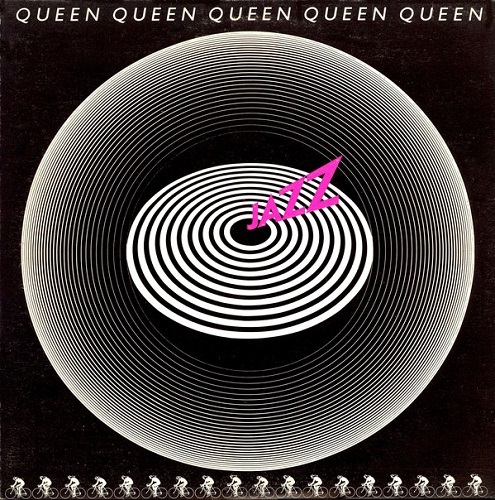 But this is still classic-era Queen, and blatant filler like “Mustapha” and “More Of That Jazz” and the heavily-disco-tinged “Fun It” aside, there’s still plenty to like here, and it’s clear from listening that the band had a lot of fun putting the record together. There are no Top Twenty hits here this time around, unfortunately, although this is where you’ll find both sides of the #24-charting double-sided single “Bicycle Race” (easily one of the most unconventional rock 45s of the late ‘45s, sounding more like a song written for the Broadway stage than for FM rock radio, even breaking out into an instrumental section guaranteed to make the listener visualize the bicycle race in question) and the controversy-provoking “Fat Bottomed Girls.” [Buyer, beware: if the latter song offends you, you definitely do not want to look at the poster that was included with the album!] “Don’t Stop Me Now” – easily one of Freddie’s most underrated songs – strangely stiffed at #86 in spite of arguably being a far more commercial song than “Bicycle Race,” but it would fortunately nonetheless become a live staple for the band and of Mercury’s signature tunes. The rest of the disc tends to get written off as throwaways, but don’t be so quick to skip past them all: “In Only Seven Days” contains what might be the prettiest melody John Deacon’s ever written, and “Jealousy” is similarly one of the band’s most underrated ballads, while the straightforward rock of “If You Can’t Beat Them” is just plain fun and the music-hall stylings of “Dreamers Ball” sound like something that would have been just at home on one of Leon Redbone’s delightful albums from the same time period.